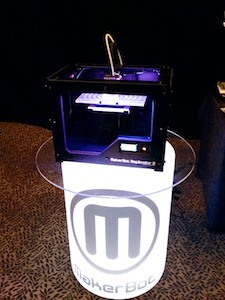 Before I even got in I saw someone I recognised - CEO of Makerbot, Bre Petis, who I managed to talk to for a little bit. Nice guy, very willing to talk and discus some details of his latest machine the Replicator 2. I was quite impressed by it, there's a professional feel to the machine that you don't usually get in this price range. On the other hand the print output it produces while very good, isn't unachievable by other machines provided well tuned. Makerbot are creating some impressive things and doing so with style, it's just a shame they've turned their back on open source and hobbyists. That polished glowing pedestal was a symbol of how far they've come, yet also how closed off their company has become; a shame really as they helped kickstart the open hardware movement. 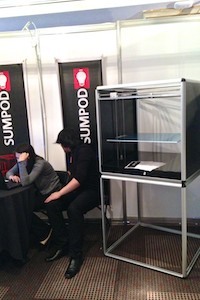 Once I got in I saw the Sumpod 3D printer which was another machine that looked very well made and I'd seen online previously. It was nice seeing it in person because it's much sturdier than photos suggest. It was even nicer having a lengthy discussion with the creator about 3D printing, other 3D printers… and photography. I found it refreshing that the Sumpod's father was happy to talk about anything and everything, without constantly being in sales pitch mode. I should add that he was there with his daughter who has a significant role in the company, and was equally as nice. At their stall they also had a one of a kind work in progress machine - a huge scaled up version of the Sumpod they were building on commission for an architect (see picture). I think that really shows it's a good design when you can more than double the size with minimal changes. I only wish I could have seen the massive machine zooming around. Next I spotted Brook Drumm of Printrbot nestled in a corner. I took a special interest in that stall because the Printrbot is the printer I have at home. I introduced myself to Brook by saying I was one of his Kickstarter backers and his eyes lit up. He asked how I was finding it, and we had a lengthy discussion about various aspects of his different models. In the short few months since I backed he's discontinued my model and come out with improvements, so most of my suggestions had already been taken into account; it was great to see the progress he's made. While I was keeping Brook busy his wife was fielding questions from other passers by, and then later we switched and I ended up talking to his wife. Both of them were really lovely people, so willing to talk to genuinely interested people and eager to replace a damaged part I have for free. I feel like they really went out of their way for me, and anyone else they can help. Currently they are running a buy 1 give 1 to a school scheme on their simplest printer, these makers really want to make a difference in the world. I think that modest stall was the highlight of my day. Heading upstairs I found Ultimaker, who had the most printers on display of any company. They had them side by side and stacked up. Most of them were printing bracelets live, again pretty unique compared to other stalls. Even better, they had modified the firmware so that once a print was complete the print head would move down and forward thus flicking the print off the printbed and into the crowd of passers by as a souvenir to keep. This process would then automatically repeat, genius! How could anyone possibly forget Ultimaker after one flicked a free bracelet at them, I think this was the best marketing technique of any company there by far, and didn't require the founders to utter a single word of marketing crap. I loved this stall for that. They also had a guest presenting with them - a local Ultimaker user who had fine tuned his machine to make ultra high quality prints (better than Replicator 2 probably) and he was happy to explain his mods to interested visitors. I found the actual stall holders to be a little cold though, seemingly unwilling to talk much to anyone, which is a shame considering how good the rest of their experience was. BitsFromBytes had a large machine (again bigger and sturdier than it look in photos). It had 3 print heads, which is pretty uncommon in consumer level machines, and seemed to be built like a tank. Because of all the added weight from extra heads and metal parts it printed very slowly, but the results were quite decent. I'm not quite sue who the target market is, however, as I'd think most people would be happy with one color, printing faster, taking up less space, and costing much less. 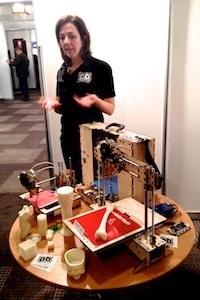 3D Systems were showing off their Cube printer, by having it print espresso mugs for use in their popup caffe. The problem is, their machines print so slowly that not many people got the chance to have any coffee. The machines are plasticy, with a small print area, poor print quality, slow, and hideous plastic colors. I hope nobody is fooled by their marketing into buying one because they are pretty rubbish. Other bloggers who have seen them at other events report that sometimes Cubes are displayed next to prints… that they didn't actually create! That's right, to show off high quality prints they actually put some BitsFromBytes prints next to their Cubes - false advertising no? Many of their sample prints are not their designs either, yet they don't credit the original authors of the 3D files. Overall, this seems like a sleazy company producing a crappy product. Not impressed. Finally, the show didn't just have 3D printers and companies, it also showcased some artists. 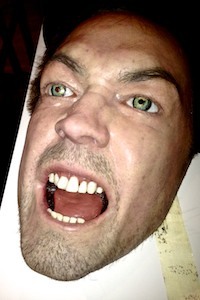 One artist used a combination of 3D printing and traditional modelling techniques to create detailed (and creepy) heads. 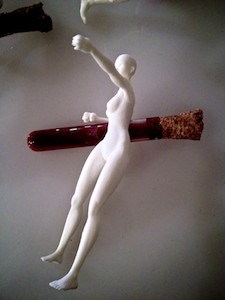 Another artist created printed 'dolls' with vials filled with a red liquid representing blood - highlighting the stark contrast between nature's creations and the creations of these stark man made machines. There were also 3D printed high heels and jewellery (think accessories tailored to fit you perfectly, or designed to match your style). Another interesting use of 3D printing that was highlighted is recreating artefacts - a precious archaeological find is 3D scanned, then 3D printed thus preserving it. A smattering of guards gave areas of the show a slightly uneasy feel, but I can see why they were deemed necessary around stands showcasing gold prints and precious artefacts. Overall, this was one of the most varied, engaging and interesting event's I've been to. I hope there's another next year.